Dr. Jo Blondin, President of Clark State Community College serves in many capacities in the Dayton community. Yet, her top priority is the development of students- making sure they are either work-force ready or prepared to transition to a four-year institution. In a Lean In Dayton interview, she explains how two-year colleges such as Clark State are often necessary to the preliminary development of college students and serves as a critical pathway to successful futures. Women For Action: You are currently making some changes at Clark State. How crucial is it to remap that way we look at junior colleges or associate degrees? Dr. Jo Blondin: It is the workforce issue of our time. Associate degrees and certificates are proven to be more valuable in some cases than four-year degrees and in order to close the skills gap here in the United States, and allow for our population to make not just a living wage, but enter the middle class and achieve the American dream. In a certain way, community colleges are the gateway to the middle class. So it's never been more important. Women For Action: You hold a Ph.D. in English from Arizona State University; Master of Arts in English from Arizona State University; and Bachelor of Arts from Purdue University majoring in English with a minor in Spanish. It would seem that you carefully mapped out your career path. Did you plan or envision presiding over an educational institution? Dr. Jo Blondin: You know, I did. It was one of my goals. A very unhappy freshman year in college spurred my career goals. I felt very disconnected. When I was a freshman at Purdue, I was more interested in let's say the social aspects of being in college. Though I was a strong student in high school, I did not focus the way I needed to in my freshman year, particularly my first semester. In some ways, I was not emotionally, psychologically or even academically prepared for a four-year institution and so I had the opportunity to refocus myself and really commit to being a good student after my first semester, freshman year. I realized something was missing. I got straight A's that second semester, but then I realized there was an aspect of my education that was missing which was a connection with people and fellow students on campus. I got involved with Purdue student government, particularly in my sophomore, junior and senior years. Consequently, I saw that we were making some changes and impacting the campus itself. Once I realized that students banding together could make a difference, I took a look at the larger institution and realized that I could change things. I felt that, if I were in charge, I would change things. It was during my junior year in college, that I said that I wanted to be a college president. Women For Action: Was there something going on at the time at your university that made you reflect on the college environment which led to you wanting to make changes? Dr. Jo Blondin: Not exactly. I felt that I wanted to have a say. It was really about having the opportunity to be collaborative and be heard by the administration and make some changes. Particularly, I was very involved in women’s issues and issues of diversity and equality. That galvanized my involvement in student government and the campus. Women For Action: Can you provide an example of how you and your school is working with the city of Dayton or Dayton's business community to ensure that the talent pool is transitioning into gainful employment? Dr. Jo Blondin: I can give you one example. Clark State works very closely with Wright-Patterson Air Force base through internship programs, particularly around some of the programs like artificial intelligence and cyber security, to address the skills gap and create talent for employment in our region. That's one example- our strong cooperative internship program. It's not just with Wright-Patterson Air Force Base, it's also with many of the contractors around the base. Women For Action: Your school is a large employer as well, correct? Dr. Jo Blondin: We have 622 employees at Clark State. 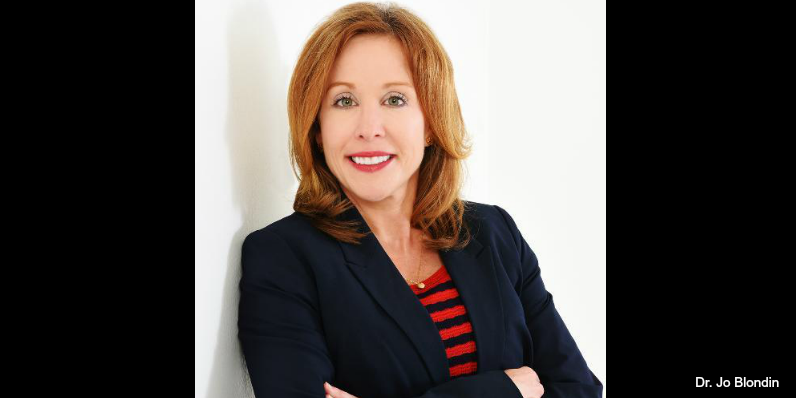 Women For Action: One thing Lean In suggests is that a career path is like a jungle gym, not a so much like a ladder, contrary to what so many people might perceive. In what ways has your career not been structured or lined out for you? Dr. Jo Blondin: A really good example is when I graduated and received my doctorate at Arizona State. I went through a joint Ph.D. program. With all due respect, I ran through the program. Its duration was five years. However, most Ph.D. programs last 5 years. But I was very motivated to get out in the workforce and become an English faculty member or to be an administrator. I was very interested in becoming a college administrator. However, one of my mentors at the time, told me that really and truly if I want to be a college president someday, I had to have been a faculty member. “You are a very good teacher. You are outstanding." Having said that, I won several teaching awards, and I enjoyed teaching but I really wanted to be a college administrator. She explained, "You need to go through the ranks of a faculty member before you can even consider being an administrator.” When I graduated, I applied for a few administrator positions but thought better of it on her advice, and applied for some faculty jobs. I became an associate professor of English. First, I was an instructor and assistant professor of English, then associate professor in English. Then I became the department chair in English, social science, and communication. That was my first real administrative role. She was absolutely right. It was the right decision. Once I achieved that administrative role, I left and went to another college and was head of student affairs. Then I became chief academic officer which is someone who is in charge of the faculty. Later, I became the chancellor of the campus. As chancellor, I was the acting head of the Ozark Campus ofArkansas Tech University. So it was good sound advice but it wasn't necessarily my plan at the time. It's a traditional path in higher education, but it wasn't the path I foresaw. However, it was the path I decided to take and it was a smart decision. Women For Action: How did you learn to stay focused even though you could not see what was in front of you? What kept you moving forth? Dr. Jo Blondin: What keeps me focused is that I will never forget what I call my core business which is transforming students' lives. I never forget that for one minute. That's what I do every day and I don't even need to remind myself that often. I just make sure that everybody on campus knows that if the students are not there, we will not be there. We are present to make sure they successfully transition into a four-year institution or leave our institution with a job. That keeps me focused. Women For Action: What challenges or obstacles had you faced specifically because of your gender? Dr. Jo Blondin: I have been surprised at times at the way I'm perceived as a result of my gender. I’m very confident in my ability. I feel I project that confidence and certainly I'm trained and I have the background. I always recognize that in anybody regardless of their gender. Even so, I'm often surprised at when I'm the only woman in the room, one of the few women in the room, or even when I'm not addressed and my opinion isn’t taken under consideration. Frankly, as I told one of our students recently, who had a situation where she felt she was discriminated against based on gender in her workplace, I said to her, “You have to learn to look people in the eye, project the confidence and the ability that you have and do your very best. You can hope that this will change, but the bottom line is that you need to make sure that every day you are coming to work doing what you can do. And it is our hope that eventually we [women] will be convincing enough.” Sometimes that’s not enough- to be convincing, confident and good at what you do - it's not enough. There are times when you have to be very brave and you must stand up for yourself and you must stand up for your gender. If you see that there is some level of discrimination, you need to call it out. I had to do that on a number of occasions. I've had to say, “Look, this is our position on this...or you are not listening to me because it's coming from me and so here’s the data.” I look them straight in the eye and say, “You need to understand that this is about an issue with students and we would like to build this facility or we would like this opportunity for our students.” There are times where I had to call out the discrimination and I have no compunction whatsoever with doing that and frankly I never have. Women For Action: What sort of support did you have which led to where you are today? Dr. Jo Blondin: The irony of this is that many of my mentors have been men. I have the best mentors that anybody could have asked for. I don't mean that they are perfect, but I have had excellent mentors who have had my best interest at heart. I've also had a very active role with those mentors. This is an interesting concept. I taught them how to treat me. I was very clear about what my goals are and I think it's been a great opportunity. Of course, the support I received from my parents- my mother passed away this year, but my father is invaluable because in my opinion, behind every strong successful woman is a good mentor and certainly, I hope support from her family, whatever that family looks like. Also, I have an identical twin sister who is my closest ally. We are very close and supportive of each other. We can say anything to one another. I think that the combination of my three very strong mentors I've had through college and graduate school, my parents and, of course, my twin sister, and I can't say enough about my husband- we just celebrated our 16th anniversary, has been instrumental. In fact, I take him to almost every event at Clark State. Often, people say to him, "Why are you here?" I am confident that they wouldn't say that to a wife of a male president if she accompanied him. But they say it to my husband. Then I turn to everyone and explain, “We’re a package deal.” He is very supportive of me. He is a computer programmer and is very accomplished in his own life. But he also understands that he is there to be part of this great opportunity I have to affect students. Actually, he was an English faculty member at one time. He understands what I'm doing and how I need his assistance and support as well. Women For Action: How do you feel your work has helped women? Dr. Jo Blondin: I’m always looking to be a mentor or offer support to female employees at Clark State or anywhere, in any situation. 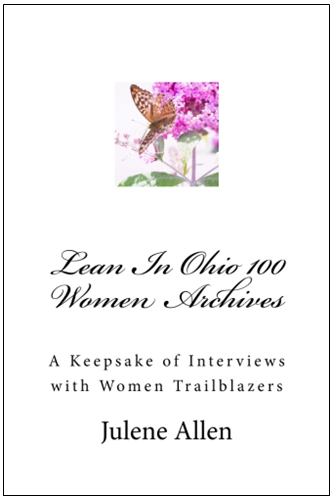 I've created a really fine network of women I not only trust but women I go to for advice in the Dayton region. I've developed a lot of friendships. I do feel like I'm very supportive of women and certainly their multiple commitments. One of our high-level employees had a lot going on this week. It was a stressful time and her child came down with meningitis. She explained that she wanted to be at work. I responded by stating, "Are you kidding me? You stay home. We got this. We are a team. You stay home and take care of your child." I knew that's what she wanted. She doesn't want to be at work when her child is sick. I think that being supportive as much as possible of all our employees, male and female and understanding that family comes first and then possibly the workplace, is crucial. I think that bringing that kind of empathy to the campus is invaluable for morale. Women For Action: What single piece of advice would you give to a woman who is interested in your career path? Dr. Jo Blondin: One piece of advice that I received from one of my mentors and I don't always follow it though I have to keep myself in check, is that "Don't ever confuse who you are with the job you do.” When someone attacks Clark State or when someone gets angry with our institution, they are not angry with Jo Blondin, they are mad at something regarding the school. I try to separate that because if you don't, that's really the end of your career. It's' really a challenge to maintain my health and my balance if I suddenly decide that Clark State is Jo Blondin and Jo Blondin is Clark State. This school is so much bigger than I am and every day I work to improve it. Yet, when something goes wrong, I hold myself accountable, but it doesn't affect me personally. 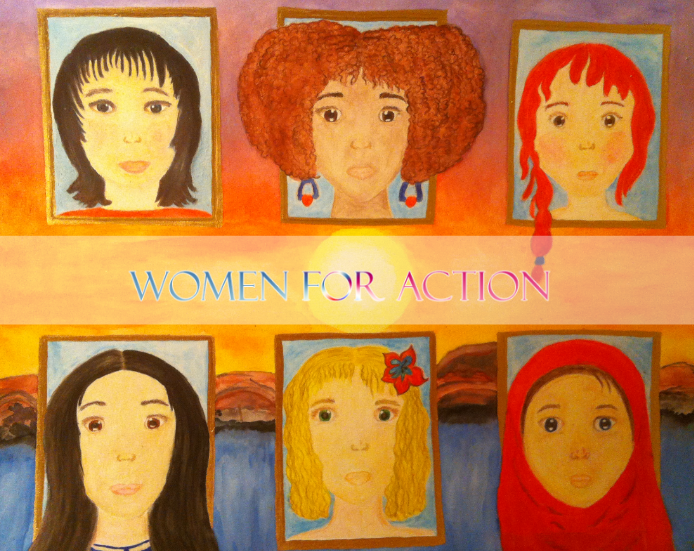 Women For Action tells stories about the under-recognized efforts of women-firsts, award winning subjects and other women of significance. We search for innovators with a vision and tell their stories. We champion their efforts to create a discussion and initiate a wave of action across the globe. 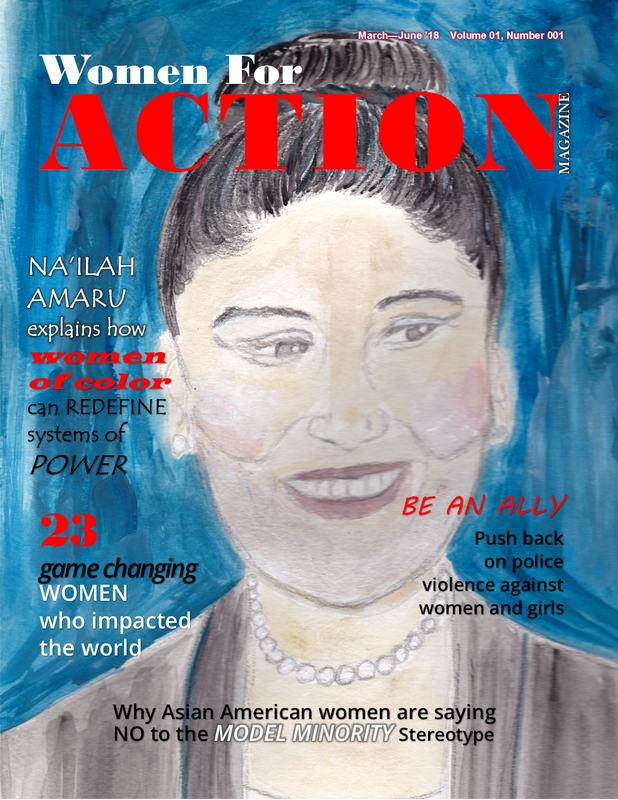 Women For Action Magazine brings you interviews and updates on a wide range of global women’s issues! 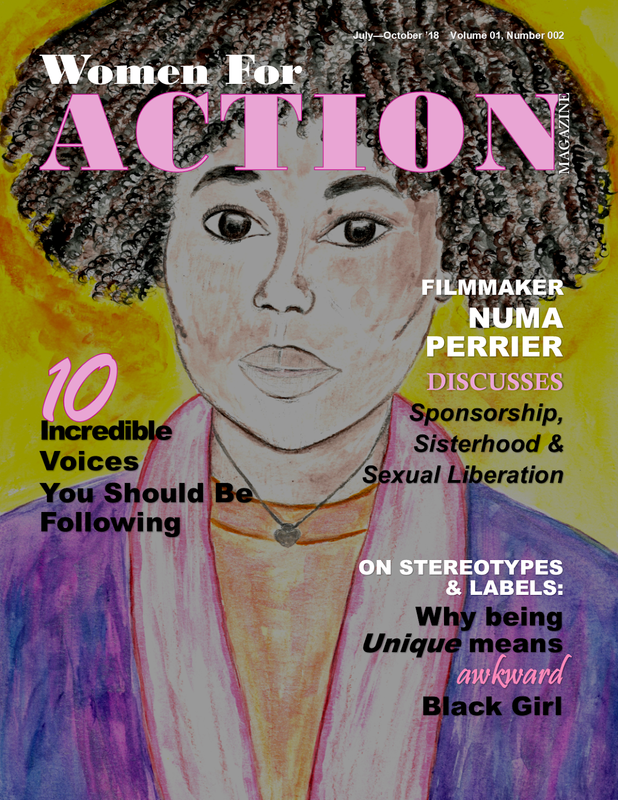 Women For Action is a 501(c)(3) organization which works to do public good by elevating the voices of women and girls across the globe through an interview series. This work by Women For Action is licensed under a Creative Commons Attribution-NonCommercial-NoDerivatives 4.0 International License.